All AXI playhouses are fitted with water-proof roof panels, and finished with a protective water-based stain. In and around an AXI playhouse, children can climb, slide and discover to their heart’s content. An AXI playhouse is a child-sized fantasy home. 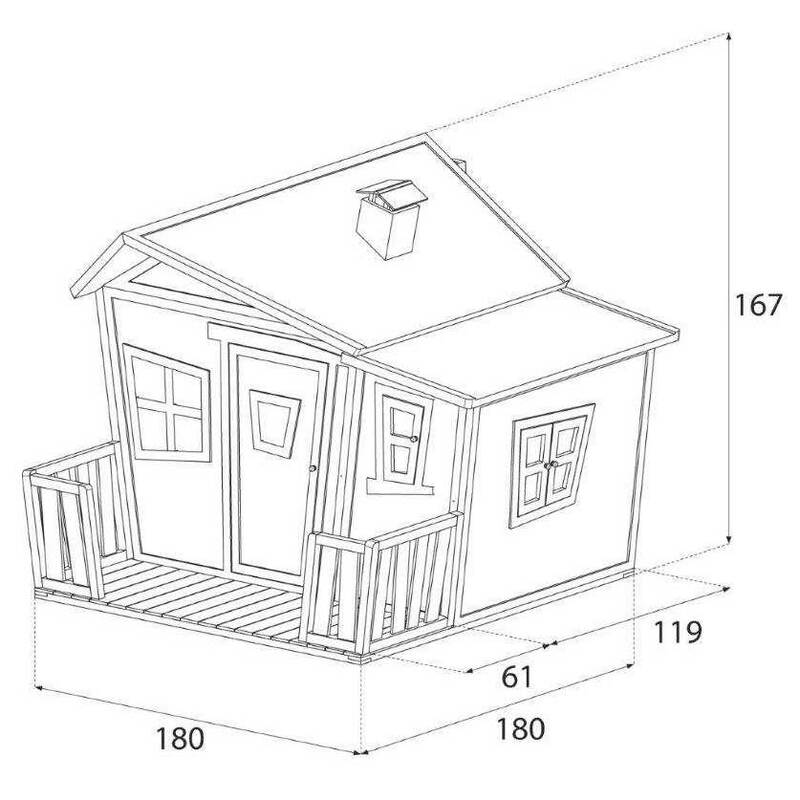 Some playhouses are equipped with their own veranda, while others have a slide or even a sandbox. With its unique features, each AXI playhouse gives free reign to your child’s imagination. A playhouse today, a castle tomorrow, or even a boat... The creators also let their imagination run free when designing and developing AXI playhouses. The best and most creative ideas were transformed into beautiful creations. Needless to say, each AXI playhouse is designed and produced with parental considerations in mind. AXI playhouses not only provide hours of fun and amusement, they are also safe, strong, robust and easy to assemble. 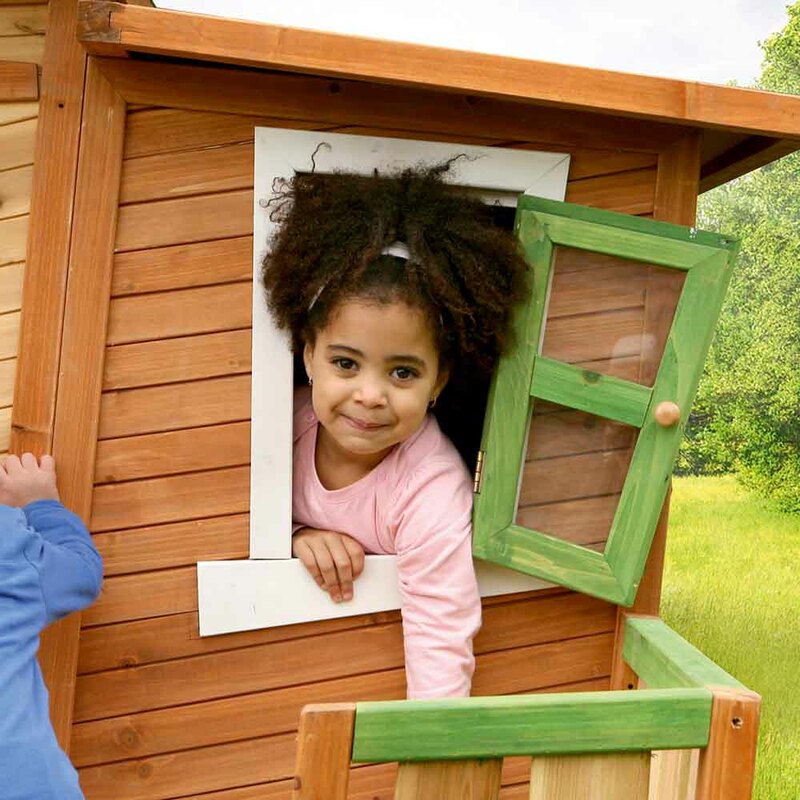 By choosing an AXI playhouse, you choose a fun and safe playing environment for your child. 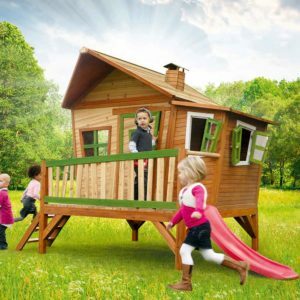 All playhouses have CE/EN71 Safety Certification, ASTM Safety Certification and have also passed a TÜV product test which is one of the strictest standards governing the safety and quality of toys. All playhouses are sanded to a smooth finish for extra safety. The slanted window frame construction prevents small fingers getting trapped, while the magnetic catches on the windows and doors are extremely child friendly. All staircases have flat treads, enabling children to clamber up and down the playhouse in complete safety. Also the top of the slide is fitted with a rail for extra safety. 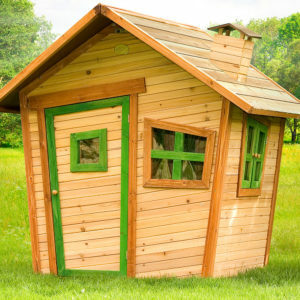 The playhouses have been treated with a water-based stain for extra, lasting durability. 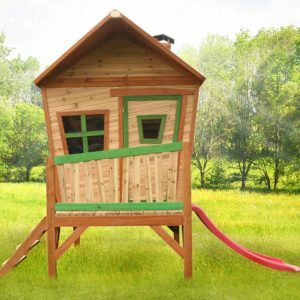 Water-based stain is non-toxic and contains the minimum of organic volatile substances, enhancing the safety of the playhouses. AXI playhouses are not only beautiful to look at; they are also strong and robust. The panels of the playhouses are made of 15mm cedar planks, slotted into an extra-thick, 38 mm framework. 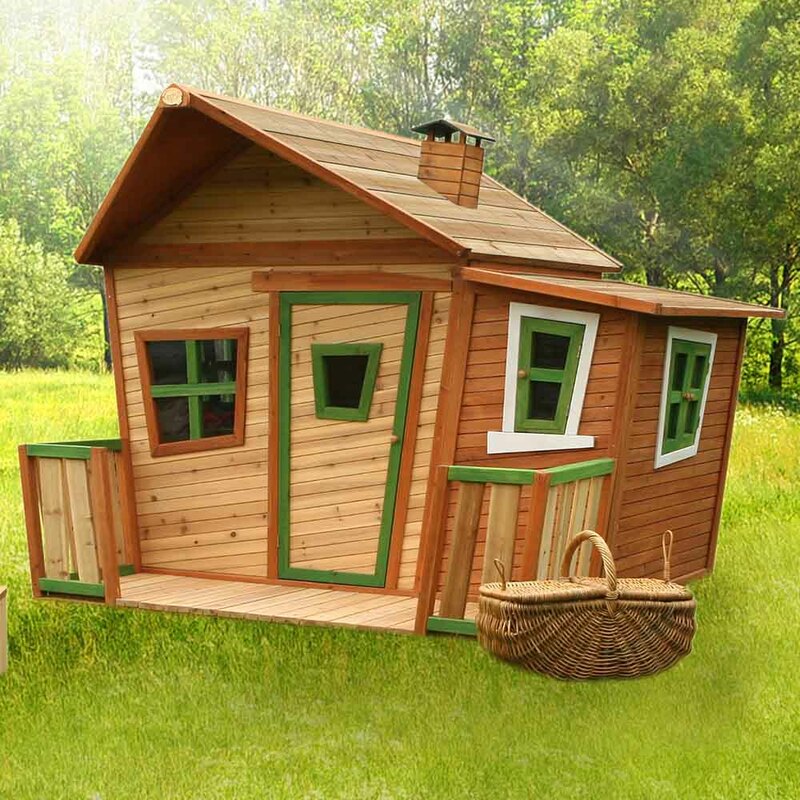 The heavy frame and robust construction ensure that the playhouses can withstand a knock or two. Cedar wood is harvested from sustainable forests. It is low-maintenance and naturally impervious to insects, vermin, rot, and fungus. 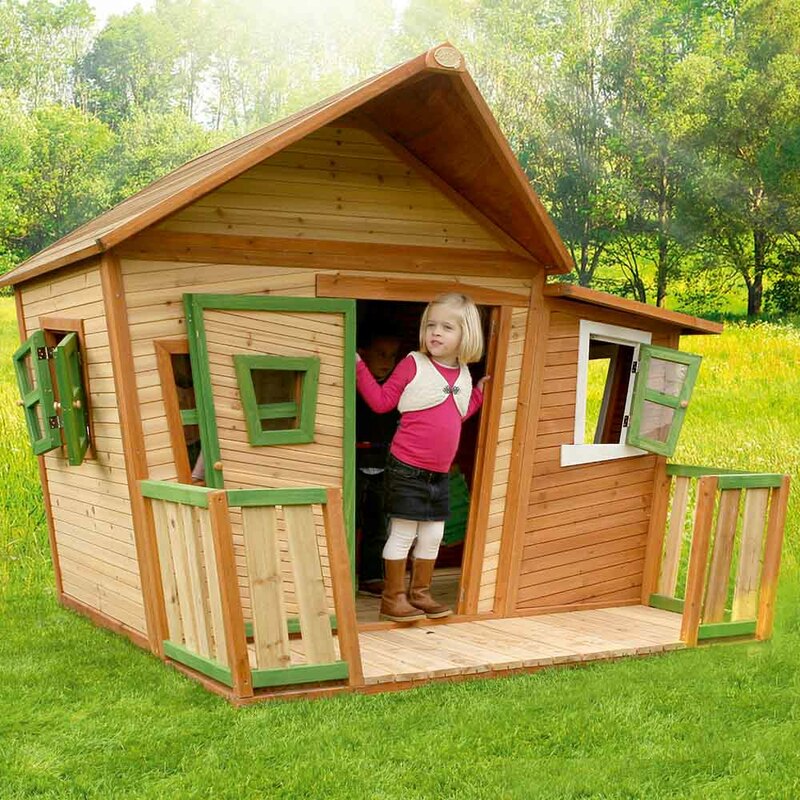 This guarantees lasting durability of AXI playhouses, without the use of unnatural, durability-enhancing chemicals. To achieve maximum durability, all AXI playhouses are fitted with water-proof roof panels, and finished with a protective water-based stain. AXI playhouses are made of Asian cedar wood, Cunninghemia lanceolata. This wood is 100% FSC and sourced from carefully managed, sustainable plantation forests. One tree is planted for every tree cut down. Our meticulous approach to the selection of suppliers underlines our commitment to protecting the long term well-being and safety of children, their parents and the environment; now and in the future! 1,2,3...I’m ready to come out and play! Turn your child’s dream into a reality with an AXI playhouse. All AXI playhouses are supplied with pre-drilled, ready-to-fit panels. Assembling an AXI playhouse really is child’s play! The ready-made panels are delivered complete with fitted windows and doors. Even the paintwork has been done for you. The only thing you need to do is piece together thepanels and watch your child play...! 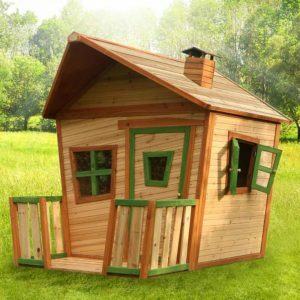 The quality of AXI playhouses is backed up by a five-year guarantee on wood, in accordance with our warranty terms and conditions. AXI playhouses are sold via authorised dealers. Our highly knowledgeable dealers will be happy to answer any question you may have.